The recipient has contributed to the development of a method for analyzing entire bodies and organs with single-cell resolution as a method of researching life phenomena at levels from the cell to the organism. Due to the development of molecular biology, analysis of intracellular systems has become a broad area of research, but the main focus is analysis of separated cells, and it has been difficult to comprehensively analyze cells in a state which maintains positional and functional information of cells in an organ or organism. To address this problem, methods of clearing tissues via chemical treatment have been attempted for many years, but Dr. Ueda has improved the degree of transparency by improving previous methods for suppressing light scattering, reduced light absorption by eluting the heme in hemoglobin contained in plentiful amounts in living organs, and succeeded in clearing organs and entire organisms of adult mice. It is appropriate to grant the Yamazaki-Teiichi Prize for this work, which has opened the way forward for this approach to become a powerful technology for elucidating biological and pathological phenomena in which cell dynamics or a small number of cells at the organism level have crucial significance, in areas such as full body visualization of the progress of metastasis⁄seeding of malignant tumors, and tracking the migration of immune cells. For above reasons, Dr. Ueda has been awarded the 15th Yamazaki-Teiichi Prize in the Biological Science and Technology field. The recipient has focused consistently on research to develop systems approaches and elucidate the basic principles of living systems. Due to the large-scale genome project around the year 2000, the life and medical sciences comprehensively analyze to biological phenomena at the level from molecules to cells. Although these systems approaches based on the genome are effective for understanding biological phenomena at the level from molecules to cells, it is hard to apply them to biological phenomena at the level from cells to the organism. In order to realize systems approaches at the level from the cell to the organism, it is essential to establish versatile technologies at the cellular level. Previous methods have been developed for reconstructing 3-dimensional images by obtaining a few hundred to a few thousand continuous slices of an organ, and then overlaying the slices by adjusting their position and angle with a computer. However, this method requires considerable time, labor and cost. On the other hand, in experiments where a mouse is sampled every few hours, and the 24-hour rhythm of nervous activity in the entire brain is observed at the resolution of a single cell, there is a need for technology enabling observation, in a short time and with good reproducibility, of a few tens of full mouse brains. Thus the recipient has worked to develop a technology which can make an entire body of adult tissue transparent, and enable observation with single-cell resolution using a light-sheet illumination microscope. The reasons why tissue is not transparent is reduced light because light does not travel straight through, due to (1) light scattering or (2) light absorption (Fig. 1). 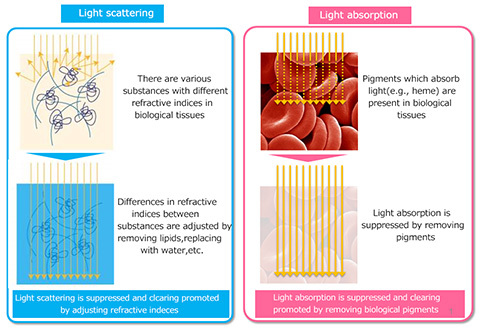 Light scattering occurs due to the presence of various substances with different refractive indices (e.g., water, lipid, protein) in biological tissue. Techniques for clearing tissue (making it transparent) have a development history of over 100 years, but efforts have previously focused primarily on light scattering and visualization of the 3-dimensional distribution of proteins by minimizing differences in refractive indices between substances. However, there was no method with high safety, convenience and reproducibility, gentle on proteins, featuring superior performance (transparency). In addition, it is essential to remove pigments which exist in biological tissues (particularly heme contained in red blood cells) in order to suppress the absorption of light which is another crucial factor for achieving transparency. Previously, the classical technique included removing red blood cells through perfusion, and chemically destroying pigments such as heme using substances like hydrogen peroxide. However, there were problems such as difficulty in sufficiently removing red blood cells in capillaries and other narrow blood vessels, and also destroying proteins together with pigments. The recipient constructed a unique screening system employing the brain itself in order to develop a clearing technique. By dramatically improving the ordinary method of testing a single compound using a single brain, a new method was developed in which screening is performed using a PFA-fixed brain paste after the brain is mashed. This made it possible to test conditions for many compounds using a single brain, discover that a set of amino alcohols enables tissue clearing at a higher level, and an efficient clearing reagent was finally developed by adding one of these amino alcohols. The CUBIC reagent developed by the recipient differs completely from previous clearing techniques which aimed to suppress the scattering of light. It became the world's first clearing reagent to achieve suppression of light absorption under chemically mild conditions through an amino alcohol heme removal effect (Fig. 2) discovered completely by accident (Tainaka et al., Cell, 2014). From the standpoint of suppressing scattering, this work succeeded in solving various problems in prior research, and in the end provided a high-performance technique for clearing even the brains of primates (Susaki et al., Cell, 2014). More specifically, existing clearing methods using organic solvents (hydrophobic solvents) have problems such as safety issues due to the production of toxic substances, and the unavoidable degeneration of proteins due to the use of organic solvents. In the clearing technique (gel, electrophoresis type) in which the tissue is fixed with gel and electrophoresis is performed, a device was necessary, and thus it was difficult to achieve clearing of many tissues in parallel or clearing of large-scale samples because it uses sophisticated devises and electrical conditions. On the other hand, existing methods using water solubility (hydrophilic solvent type) are safe, gentle on proteins, and enable clearing of many tissues in parallel (by just dipping into the regents), but they have the problem that performance is poor compared to the organic solvent type. 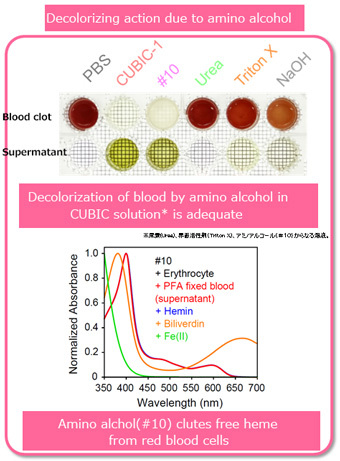 The CUBIC reagent improves these issues by using the lipid removal action of amino alcohol, and has become the world’s first clearing method which resolves all of the difficulties of the light scattering problem. The CUBIC method has succeeded in achieving a revolutionary broadening of the scope of biological application by simultaneously resolving the problems of light absorption and scattering. 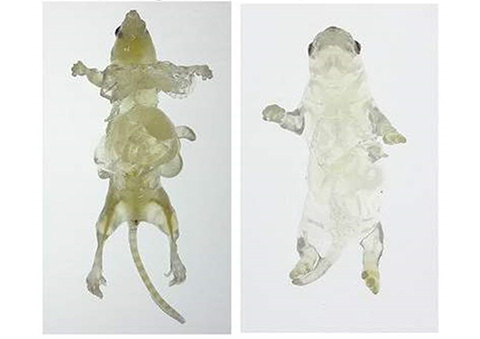 More specifically, the method has achieved the world's first clearing of an entire mouse body by clearing the tissues rich in the blood which are difficult to clear due to light absorption via the pigment removal effect of amino alcohol (Tainaka et al., Cell, 2014). In addition, clearing of the entire brain of a primate was achieved for the first time in the world by exploiting the high performance, safety, convenience and reproducibility of this technique (Susaki et al., Cell, 2014). In order to further exploit the high performance, safety, convenience and reproducibility of the CUBIC method, efforts were made to develop computational programs enabling quantitative comparison of multiple samples, and computational techniques were successfully developed for directly comparing changes in cellular activity in the same region through registration of acquired imaging data with respect to a standard organ image. As a result, this CUBIC method developed by the recipient, which enables analysis of all cells in an entire organ or body, has broken new ground by providing a new technique for realizing systems approaches at the level of cells and organisms. There are high expectations that this technique will make future contributions in various fields of biological and medical sciences.